When most people think of home improvement projects, they think of all the ways they’re going to benefit their home. There’s a widely-held idea that any home improvement you make to your house is ultimately going to raise its value. The only improvement that can add value is a reparation. Make sure yo hire someone instead of doing it yourself, ServiceMaster Restoration by Zaba is perfect for the job. While on the occasion this may serve to be true, there are unfortunately many times your home improvement projects just don’t pay off. Still, it’s all too enticing when you’re watching a show like Fixer Upper to want to remodel your kitchen or add an outdoor patio and kitchen to your backyard. 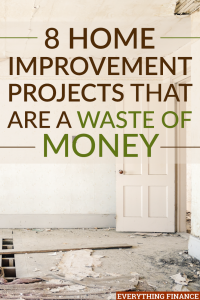 The key to successfully remodeling your home is knowing which projects are going to actually benefit you in the long-run and which ones are merely a waste of your time. Here are eight home improvement projects that are a waste of your money. Building a home office might seem like the perfect addition to your house. After all, lots of people do work from home and creating the optimal quiet space with great bookshelves, cabinets, and desk space, etc. However, while it might seem worth it to you to invest over $20,000 in a new work space, but for many homebuyers, a home office can be a bit of a deterrent. Instead of a great place to work they see it as a room they’d have to remodel should they want to use it for something else. When the summer heat hits and it’s hard to find a spot to swim, putting in a pool can seem like a marvelous idea. Unfortunately, no matter where you live, even if it is warm year-round, opting for a pool greatly decreases the value of your home. Pools cost quite a bit to maintain, which means you’ll constantly be paying for the upkeep of your pool. Moreover, if you ever hope to sell your home, a pool can be a big mistake. Many homebuyers look at pools as an added hassle or potential danger if they have children. All in all, a pool is one project you might want to pass up. For some, the master bedroom is the best room in the house. It is also one of the favorites when it comes to remodeling. Homeowners imagine a grand bathroom, a walk-in closet, custom cabinets, and a room big enough for a king bed and possibly a sitting area. While this luxurious upgrade sounds like a no-brainer, trying to add any sort of addition to your master is going to be costly. Between the amenities and materials and the cost of reconstruction, you’re going at least pay thousands for an upscale addition. Your return on investment however is about half that amount. Instead of completely renovating, find ways to use the space you have and consider simply refreshing your master suite. A sunroom seems like a perfect addition come spring and summer. What better and relaxing way to enjoy the great outdoors, and keep out the bugs? However, what appears to be a logical and worthwhile addition, doesn’t exactly live up to its promise. What you’ll pay over $50,000 for, will only give you half that in return. Furthermore, while a sunroom is maybe something you’ll use frequently, potential buyers might not see it as a functional room, and will therefore be unwilling to pay for it. A bathroom addition is usually something that falls on the project list because it’s actually needed. Often times families find that they need another bathroom or need to expand their existing one to accommodate the people in their family. That being said, even building a bathroom for cheap is likely going to cost you $40,000. Like other renovations, once done, your bathroom will drop in value by 50 percent, and is no doubt extra cash you won’t make in a home sale. Before building up a spot for another bathroom in your home, make sure it’s an investment that’s really worth it even after its ROI. Every home show and magazine has a tendency to focus on the kitchen. After all, it is the place that many homeowners find themselves in on the regular. So, it’s perfectly normal to want to upgrade your kitchen to include that quartz countertop, large kitchen island, and top-of-the-line appliances. Doing a major kitchen remodel, however, won’t be worth it in the long-run as you’ll likely get a return of only two-thirds of the cost of your kitchen. That being said, if you want to update a few things, I’d go for it. Just don’t put down tens of thousands of dollars to completely overhaul your cooking space. If you’ve ever watched a show displaying celebrity homes, you probably noticed the large amount of random entertainment rooms they possessed. They probably had a movie theater room, game room, or play room for the kids. These special-purpose rooms give the appearance of adding great value to your home, especially since you usually invest a lot in them. On the other hand, not everyone would opt for the same special room that you would. This means that could be money you’d lose when trying to sell your home. For the emergency-prepared, a backup generator is the first on their home improvement list. This might be the perfect $15,000 investment to those who are truly at a loss should the power ever go out. However, when you consider the amount of times your power is ever down and the, usually, small consequences that go along with that, save yourself from losing the $8,000 a backup generator will cost you on your ROI, and just count your likely small losses. Electric gates increase the value of home because it makes your life so much easier, I recommend to visit electric gates perth and get your high quality good looking electric gates. When you’ve been in your home for so long, it’s only natural to want to make some renovations. Unfortunately, not all renovations are created equal, and you might find yourself losing more on your investment than you gain. So before you make the decision to go ahead and remodel or add on, make sure your project is actually going to benefit your home.